HomeThe tool for the job. I have an interest in boys writing and have been fascinated by some of the stories our children write around Minecraft. I was first introduced to Minecraft a few years back in 2010 via Natasha Walden @MissNWalden a teacher at our school. She told me that this game, Minecraft, was taking the gaming world by storm. However I had no idea what she was talking about except to feel quite scared when we were in Minecraft. Then nighttime arrived and I was not ready in and for this Minecraft world. I now realise we had entered Survival Mode. So I learnt there was a difference between Survival Mode and Creative Mode. Survival Mode has the monsters come out at night and Creative Mode is when you can fly around and see the world that you have made. I think that if I had seen Creative Mode I might have been persuaded to take part. Natasha is one of those teachers that drags me along in her online gaming world. Through her I had seen the inside of WOW and Minecraft before they were even spoken about in lay education circles. Fast forward to 2013 and I watched my nephew create cheat videos to access pathways on his server. He showed me a Minecraft map that he had created and has had a massive download. Normally a quiet and shy fellow, his eyes lit up passionately as he explained what he was doing and why. But again I was not quite ready with my understanding. I was still a lurker and observer. Then Shaun Wood @mrwoodnz presented on TeachMeetNZ and I was intrigued again with the Minecraft World. I started to learn about servers, and about the Minecraft Edu version. I began asking questions about the logistics of bringing Minecraft into our school. I spoke with our technical people about setting up our own server. This year however I have been consumed with Google Apps for Education as we established our domain name, learnt how to use GAFE at school, set up the architecture for teacher use and learnt how to set up and use Hapara. This is still a time consuming journey. So Minecraft sat in the back and simmered. As is with all fabulous professional learning, I spotted this #educampminecraft event via twitter. 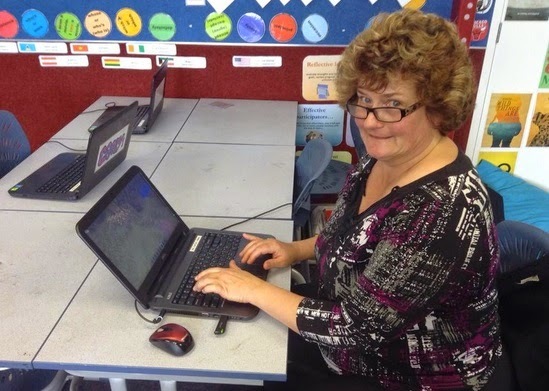 This year when Annemarie Hyde put the call out to attend I could not resist finding out more of what other educators in New Zealand were doing with Minecraft. So on Friday night, straight after school I drove down to Rotorua and joined several other educators for #educampminecraft at Mokoia Intermediate School. You can find out more about the event here on the educamp wiki. During the day, Monika Kern kept the conversation broadcasting to the rest of New Zealand via twitter and challenged us to complete a blog post about our experience of the day. By doing this I can grab a digital badge for my portfolio. I am always open to a challenge and this keeps me motivated to reflect on what I learn. I contributed by creating a twitter list of all the teachers talking about Minecraft in New Zealand and that can be accessed here. Here is a folder that I created and added photos that I took during the day. Straight after the event Reid Walker created a Google+ Community for teachers using Minecraft group and that can be accessed here. During the day it was particularly powerful to have some students there sharing their expertise with Minecraft. How often do we see students at education events? So I thought this was forward thinking of the organisers. However I do think that the students would have probably run the session in a totally different way. I loved the way they showcased their work. She taught me how to right click and put the blocks back. However I probably had already created quite a bit of havoc. We got to hear too from Natalie Dodd and her students about how they used Minecraft. My learning from all this is to go down the Minecraft Edu pathway because of time. According to Shaun who came in via skype and shared how he had set up a server, a lot of time and technical know how is required to set up a server for the children. You can read more about this on the slides. I had my questions answered and more. I saw how Steven Katene mapped using Minecraft against SOLOtaxonomy. I say how his students crafted their Minecraft planning using Inspiration. I saw how they shared their creations with family via hidden youtube URL. His school has a 1:1 ipad programme. I can’t wait to have further dialogue with this amazing educator. I had gone to Rotorua specifically to find out how to set up a server and the logistics in running Minecraft at our school. There would be legalities involved in hosting a server separate from Minecraft Edu where children take part and learn. In addition, the space would require adult supervision because our children are under the age of 14. I still observe what happens in Skoodle and know from experience that the most active online time for our children is straight after school. Some can work quite late at night. Yes we can lock it down to certain hours but also know from experience is that the children will move to other social media sites to communicate with their friends when we lock down their sites. I had been mulling over the idea of buying our own space because I initially thought the Edu licence seemed quite expensive and I am always looking for a cheaper way of doing things. However because we are dealing with student safety Minecraft Edu would be the preferred option. Another idea that I found out is that Minecraft requires a hard drive therefore striking our chrome books out. I don’t know why I had not thought about that. I thought Minecraft was an online game and did not realise that we would need plugins to download. https://minecraft.net/store A singe computer licence costs $33.16 and this can be downloaded. The Minecraft Edu Version costs $22.15NZ per single licence and a single server licence is $50.45 NZ. However with the Microsoft school’s agreement deal I wonder if this would change because of the recent takeover. At Newmarket School, we would require 1x server licence and $22.15 x each senior syndicate student and a netbook per student. So that cuts out what I had planned for the senior team because our senior classes have chrome books and Minecraft cannot go on a chrome book. I also see that there is also an iPad licence that costs $8.99. However this does not work with the Edu version. I have not yet investigated if this can be bought on the VPP store. But think that this could be an answer for us. I need to speak more to Steve about this and I have heaps more questions for him. Michael Fawcett confirmed that the pocket versions could talk together. So the Androids can talk to the iPads. Our middle school use ipad and netbooks so at this stage they are the best place to put in a copy of Minecraft. My recommendation to school would be to purchase 30 iPad licences and aim Minecraft for the middle school. But I would only do that if a teacher is willing to take the time to trial it with her class as part of teaching and learning. Like with everything on the iPad, Minecraft would go have to go through Configurator. Because we do not have 1:1 devices we would have the challenges of saving games and a shared central location of creations to deal with. So where to for us. When I think ahead for us as a school I recall the weekend conversation I had with Annemarie regarding the tool for the job. As a school we are conscious about sinking too much money into one platform as things change so quickly. The ideal tool for Minecraft appears to be a netbook, with a mouse. To make full use of the collaborative and community aspect we would require a server licence and individual licences for the students involved. We would need someone to set it up and have a teacher dedicated to be an online moderator. The alternative is to have it set up on the ipads but like with everything on an iPad, there are challenges for sharing because of the ages of our children and because they do not have 1:1 ipads. If someone can talk me through a workaround, I would love to discuss this more. I am @vanschaijik on twitter. Teachers at Newmarket School, if you have any further ideas, do let me know. My thinking around Minecraft for learning is how absolutely fabulous. We all know that learning is a social activity and what better way can we hook in our children with learning then with connecting, collaborating, creating and sharing in a community environment using a space that they love and several already know so well. Reid, you were looking for a further challenge after completing your Code challenges. How about if we go in together as educators into the Minecraft world and create something for our own learning. Maybe we could create our ideal school. I would put my hand up for that. Annemarie, Monika, Kassey, Steve thanks heaps for organising an amazing day of learning for us. Unfortunately I have come away with more questions that fortunately I can ask on the new Minecraft community. To find out more about Mincraft in New Zealand Schools, Visit the site created.To find out more about #educampminecraft, Visit the slides created. To find out more about education licences, Visit the Minecraft Edu Wiki space. The big news of the weekend was that Minecraft has just been sold to Microsoft. Delving a little into the Minecraft history brings up two names.